Trace the growth and development of the Premiership from its initial breakaway in 1992. Assess why the game’s popularity has boomed so hugely in the twenty years since the Hillsborough disaster. Discuss the implications of the spate of takeovers at the top clubs. Explain why the personal fortunes made by clubs’ directors goes against the game’s culture and history. Assess the enormous financial divide between the Premier League and the rest of football and its consequences; more than forty Football League clubs have been insolvent since 1992. Discuss the level of debt being carried by Premier League clubs and whether this threatens their long-term future. Assess whether relying on the backing of wealthy owners is sustainable in the future. Discuss the government’s efforts to regulate English football through this boom. Look ahead to what the future holds for the Premier League, its global expansion and the implications for the rest of the game. David Conn is an awarding winning writer and journalist. Through his weekly investigative column in The Guardian newspaper he has become one of Britain’s most influential commentators on football in the modern era. He is the author of two critically acclaimed best selling books on English football: The Football Business: Fair Game in the 90s? (1997); and the The Beautiful Game? 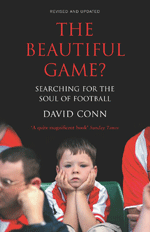 Searching for the Soul of Football (2004). Both texts present an evocative analysis of the remarkable changes in English football since the establishment of the Premier League in 1992, linking analysis of both economic and social trends to assess whether the beautiful game has indeed lost its soul in a period of financial excess, and challenging the received wisdom that the Premier League does indeed offer the model for an elite football league that the rest of the world should follow. David Conn’s weekly column in The Guardian newspaper can be viewed at www.guardian.co.uk.